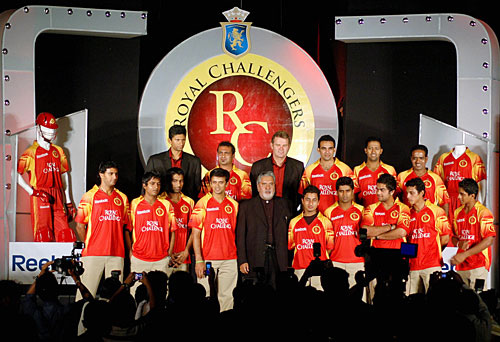 So, after the Delhi loss yesterday, I can now whole-heartedly concentrate on RCB. I am sad for Delhi, even after such a consistent performance, they were thrown out in a trice. I so wanted them to go to the finals! But alas, History repeated itself, in their case. Hmm, It's RCB *Royal Challengers Bangalore* Vs. CSK *Chennai Super Kings* today. CSK opted for batting first, and well, made 146 for 5 in 20 overs. That will mean roughly 7.4 runs per over for Bangalore to beat them. Kallis, Dravid, Pandey, Taylor,Kohli we're dependent on you guys! I am so nervous, I so hope they make it. Go RCB, go on! Mallya, give them a sip, man! (To boost there spirits, lol.) All the best! naaaahh, that makes us two sides of d same coins..kyunki world cup main we both will support India, na! ?